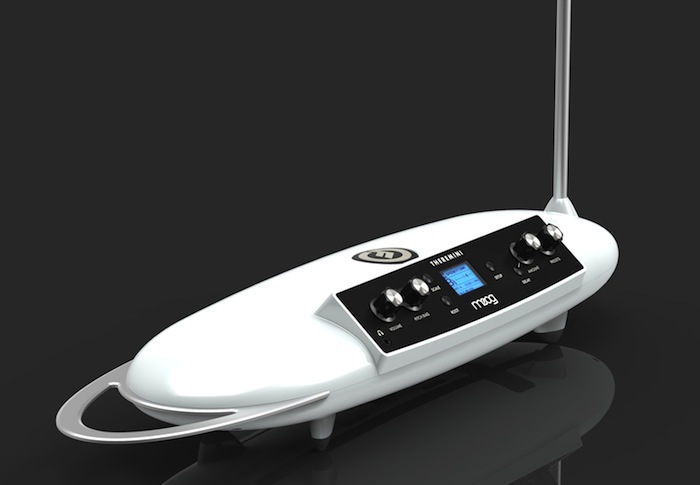 Theremin World - Topic: Moog Theremini! A great news from Moog Music. Here an article (only in Italian language) by Enrico Cosimi, but I think there we'll be more articles in the next days! Can't understand why Moog print their name on that. "Fisher price" would be a better suited trade mark. Hey! That looks like a toaster!! I designed a musical toaster once, for a wealthy member of the Saudi Royal Family (oh, I never knew the person - simply a job via a client) who wanted a toaster with a synthesiser built into it (Yes - Its true! - I aint makin it up! ;-).. I wonder if this person had antyhing to do with this "theremin" ? I think the "Moog" we once knew and loved has now died.. and the company he left is just a company out to sell whatever they can and make profit. Moog was once (rightly or wrongly) a synonym for analogue, innovation and quality - That (And Bob Moog) was all they had to set them apart from the others.. This, to me, is the final straw - the indicator that the Moog we knew is no more.
" it's a gesture controlled digital synth. Leon Theremin and Clara Rockmore are revolving in their tombs..."
Wouldnt surprise me if Bob was as well..
you know.. I felt kind of insulted when I read that this "theremin" has pitch correction assist. Guys you gotta look at the positives...like having a built-in kensington lock slot. Finally someone is listening to the demands of musicians. I'm looking forward to watching the thousands of new youtube-videos! - The tuner looks like it gives you the note letter and offset - I don't think this is very intuitive, and an LCD probably isn't fast enough for a real-time tuner display. - The feet, like on the EWS, imply you can just set it on a table or something and play it. I wonder if this is possible (like it isn't on the EWS)? - I'm kinda partial to internal speakers, even if they sound like crap, because it reduces the fiddling around for casual use. - Variable strength pitch correction is probably the most interesting thing in the feature list. - Looks like a big cross on the bottom reflecting off the table it's sitting on - I wonder what that is? I think it's storage for the antenna. - "Built in 3/8” Mic stand and Camera stand adaptor" - I think maybe a camera tripod might be a better stand then a mic stand? - "User selectable range: highest note and lowest note (stored per preset)" - Hmm, adjustable sensitivity? "I think maybe a camera tripod might be a better stand then a mic stand?" Camera tripods are designed to keep the thing they are supporting from wobbling, which is good. OTOH, the connecting bolt is a lot smaller than a nice big chunky mic stand attachment, which I'm not keen on - and they look terrible on stage. I have heard this reaction many times to suggestions about making the theremin easier to play or ideas like I had (have) of "On-Key-Emphasis" which makes the volume from the theremin louder the closer to correct pitch one gets.. I personally dont understand this reaction from skilled / precision thereminists - Surely you people know that its the ability to get the pitch you want, when you want it - the ability to modulate and glide without any artificial machine imposed constraints - its these things which make you great! .. The fact that you can get the right semitone within a few cents on a theremin is awesome - but you can get this from any keyboard! - As soon as some process imposes this on the theremin, it imposes restriction on the expression possible with the theremin. No one can compete against skill aquired by someone like you, Amey! - Or at least no-one who hasnt devoted a similar number of hours to perfecting your skill..
Sure - There will be a load of "Walk off the Earth" types posting their "Greatest theremin recording ever" videos they did a week after buying their new Moog toy - And it will come down to their devotees believing the crap (like those who watched the video of "Walk off the Earth" who couldnt recognise that it was entirely fake, had no theremin playing, had been produced on a keyboard) and arguing that it was great.. One cannot help morons like that! Not me! - I HATE the idea of having to wade through even more piles of crap just to find a rare snippet of someone who can actually play theremin to a degree which isnt mundane or painful.. I expect a massive increase in mundane rubbish with perhaps a reduction in "painful" due to the auto-tune.. I fear that this instrument could be the beginning of the end of enthusiasm for theremins - If the price is low enough that loads of wanna-be's buy one and pummel you-tube with rubbish, then boredom with the whole theremin concept could easily set in - and the theremin be confirmed as a toy for illiterate musical wanna-be's. Bob Moog re-kindled interest in the theremin and was probably more responsible for it being here today, and not just a historic novelty, than any other person. I fear that Moog Music may now be launching a product which could return the theremin to near oblivion. Bring out a GOOD theremin with extra features and even auto-tuning, yeah - but bring out a toy with these features - a toy which is unusable and/or undesirable to "real" musicians, brand it "Moog" and dump it on the market, and IMO one has a mix with the potential do do serious damage to the theremin's possible future. I must just say that these comments MIGHT be premature and even wrong - They are based on the pictures and specification.. But there are glaring indicators that this instrument is little more than a sophisticated musical toy. I wonder if theyve bothered to put any ESD protection into that toaster?